Would there be issue with page file turned off? If you turn your antivirus off it will be quicker. I am not aware of an OK to click. This is last months snapshot [I didn't take one this month], but it is the box where I clicked OK. It dropped out right after clicking OK, so I didn't get to the part where you enter an image number or ALL [*]! Thanks SIW2. Will give it another go. 1. This DISM command was posted by KYHI on splitting install.wim into FAT32 compliant parts. There was however a user comment that ei.cfg is required for this to work. Is it necessary to restore ei.cfg? 2. Would the following diskpart commands create a bootable GPT formatted USB flash drive for UEFI installation? The "convert gpt" command seems to be left out in many guides. Is it necessary? DISM++ [also highly recommended by SIW2] can run on 7, 8, 8.1, 10. I have used this and it is very easy to use! Any guides / commands you would like to share? Thanks Paul. Any guides / commands you would like to share? The posts #19, #24, #30 [by SIW2] in this thread might help: Hard drive not recognized by laptop, No bootable device. Double click the Dism++x64 application. Mount the image from the install.wim [main menu screen, click File, and select Mount Image]. Highlight the mounted image [at the top]. Click Updates in the left hand menu. If a box appears that says Update for Windows 7 for x64-based systems requires an exclusive access, click Do not install (recommended). When the Successful! box appears, click OK.
 Repeat steps , ,  and  another THREE times. On the main menu screen, click File, and select Save Image. When the Save directly or perform an incremental save? box appears, click Direct save. On the main menu screen, click File, and select Unmount Image. Optimize [cleanup and compress] the size of the install.wim. In the left hand menu, click Toolkit, and then click ImageX. Browse to and select the install.wim that you want to export, and click Open. Click on the image that you want to export, and click Export image. In the File name: box, enter the filename install2.wim. In the Save as type: box, select Max [if NOT already selected], and click Save. When the box saying Successful! appears, click OK, then click the Red Cross. Delete install.wim and Rename install2.wim to install.wim. I just ran it without any problem. That ok box does not come from my batch file. It comes from the download patch. I don't know what went wrong with yours. Possibly the download was incomplete/corrupted. That ok box does not come from my batch file. It comes from the download patch. I don't know what went wrong with yours. Possibly the download was incomplete/corrupted. Thanks for the reply SIW2, it is appreciated. I will try running it again later. I thought it might have been because I had updated image 1 using DISM++, then saved it and unmounted it. 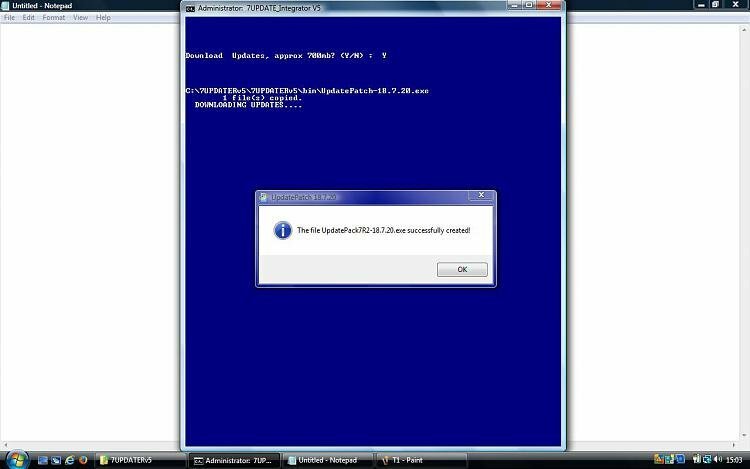 I then ran the 7UPDATER batch file to see if there were any updates that it found that DISM++ didn't. That was when it dropped me out of the batch file. I wondered if it had been because DISM++ created a new install.wim [with the image 1 updated] that wasn't fully recognised by 7UPDATER! Any help with these questions? 3. Can an updated image be used as source for future updates/drivers integration by 7updater or DISM++? 4. Can 7updater work with DISM++ modified image? 5. Can the 7updater modified image be used for system recovery? Do you mean a repair install? Yes. splitting install.wim .. Is it necessary to restore ei.cfg? I don't thnk so, but I haven't done it for a while. There was an issue with win8.1 about split wims -something to do with finding the license agreement. Maybe that is the same with10. I never heard of it in relation to win7. I would use wimlib for the splitting.